Why Choose to Stay in Marina Bay? 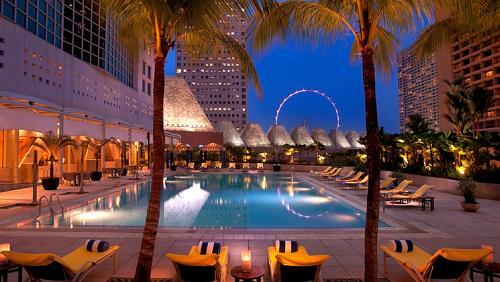 Most of the hotels in Marina Bay have stunning views of the bay and the city. Visitors and shoppers can also get their fix at the nearby Suntec City and Marina Square Shopping Malls. With attractions such as Marina Bay Sands Integrated Resort, the Singapore Flyer and Merlion Park, Marina Bay has something to offer everyone. The area's three MRT stations- Raffles Place, Esplanade and Promenade- make it easy to travel throughout Marina Bay while several mid-range and luxury hotels provide a variety of accommodation options. Marina Bay Sands Integrated Resort, a waterfront gaming resort, offers guests just about anything they may need throughout their stay. With a three-level casino open round the clock, its own art museum, live shows, and plenty of shopping boutiques, guests never have to leave the grounds to experience an exciting vacation. Dining options range from inexpensive food court fare to establishments featuring cuisine from world-class chefs. Singapore's central business district is just right across the bay. Room rates start at S$400 a night, or take advantage one of their special package deals, which include tickets to shows, credit for the restaurants, or complimentary champagne. The Conrad Centennial Singapore hotel, located on Temasek Blvd, is adjacent to the Suntec Singapore - an exhibition centre with over 300 shops and 100 restaurants - and a short walk from the Signapore Flyer. Guests who would rather dine inside the hotel have a choice between the casual Oscars on the lobby floor or the sophisticated Golden Peony on the third floor. The 31-story hotel has 22 floors of non-smoking rooms and 96 pairs of adjoining rooms. The Pan Pacific Singapore hotel rises high above the bay and is within easy walking distance of several Marina Bay attractions, including the Esplanade, Marina Square and Millenia Walk. Guests have their choice of six different restaurants, including the award-winning Hai Tien Lo on the 37th floor, which features Cantonese cuisine and a breathtaking harbor view. Each room comes with an LCD television, in-room safe, wireless internet access and electronic drapes. Executive rooms have private balconies. In-room childcare is available for a fee. Ritz Carlton Millenia Singapore is known around the world as one of the highest rated, highest class hotels, and the Ritz Carlton Millenia in Singapore is no exception. Rising 32 stories above the Marina Bay, the hotel offers unobstructed views from all angles. The Ritz Carlton Millenia features over 4,000 contemporary art pieces by world-renowned artists such as Andy Warhol and Frank Stela. Rooms include raised beds, walk-in wardrobe closets, marble-tiled bathrooms and 42-inch mounted LCD televisions. Guests can cool off in the outdoor pool flanked by waterfalls, and enjoy a cocktail or healthy beverage from the poolside bar. Enjoy a traditional English afternoon tea in the Chihuly Lounge, with a 200-piece glass sculpture symbolizing the sunset mounted into the far wall. The Mandarin Oriental Hotel, located just above the Marina Square, overlooks the bay and is just two blocks away from the Suntec City. Hotel features include a 25-meter outdoor swimming pool, a yoga studio with instructed classes, and six different restaurants. Guests can relax in the spa with a variety of treatments, from mud wraps to Asian Blend Shiatsu massages. All rooms include bathrobes, a mini-bar, complimentary bottled water and complimentary toiletries. The Fullerton Hotel Singapore sits on the waterfront and is within two blocks of the Merlion Park, the Boat Quay and the MRT. The restored historical hotel features four restaurants with cuisine ranging from Italian to Chinese. Chocolate lovers won't want to miss the chocolate buffet on Fridays and Saturdays in the Courtyard restaurant. After indulging their sweet tooth, guests can burn off those extra calories in the 24-hour fitness center or dance the night away in the hotel's nightclub. The Fullerton's new sister hotel built in 2009, the Fullerton Bay Hotel, faces the bay and has its own marina. Smaller than its sister hotel, the Fullerton Bay Hotel has less than 100 guestrooms, giving it a cozier, more personal feel. Guests can choose from two restaurants and enjoy a complimentary breakfast each morning before hopping on the complimentary shuttle to nearby shopping areas. Room amenities include blackout drapes, electronic checkout and a complimentary newspaper.